I received your grief package and am giving to a psychologist friend. She is moving to Louisiana and will be working as head of a grief clinic. We lost our son Clint last year on September 16th. His anniversary and birthday are coming up. His birthday if October 23, 1970. This has truly been a hard year for our family. We talk of him all the time, he in constantly in our hearts and minds. Please remember us at this time in your prayers. Also I am putting the butterfly sticker on my car today. We see butterflies all the time and from the first day they have reminded us Clint is with us. Also hummingbirds, chipmunks and doves. The day he died we had a large group sitting on our patio and 2 chipmunks came right in the middle and just sat there, did not move. Doves also doe this for us. Clint loves animals. I was told about your web site by my m.d. I ALSO LOST MY FIRST BORN SON ON NOV. 27TH OF 2002. HE WAS 24 YEARS OLD. ON THE NIGHT BEFORE THANKSGIVING HE COMITTED SUICIDE IN FRONT OF MY HUSBAND AND MYSELF. TO THIS DAY IT FEELS LIKE YESTERDAY WE ARE JUST HANGING ON NOT REALLY LIVING. HE LEFT US A PRECIOUS PART OF HIMSELF OUR BEAUTIFUL GRANDDAUGHTER. I MISS HIM EVERYDAY. PLEASE HELP ME TO LEARN HOW TO GO ON WITHOUT MY BOY! I HAVE 2 OTHER SONS WHOM I ADORE BUT THERE IS STILL JUST A VOID THAT I CANT FILL. Dear Drew and Jeremiah, I was so touched by your words of comfort, seeing the beautiful pictures of your precious sons and sharing your life with all of us has given me hope that we too will be able to find our way through our grief. We lost our precious daughter Jessica Anne June 2007 as a result of an automobile accident, she was such a loving warm child full of promise and every minute our heart aches for her. We have set up a scholarship in her name to help others achieve her dream of being a nurse and have a website www.memory-of.com for her. Thank you for your sharing your story and for touching our lives. Oh, what precious peace our Lord brings! My brightest hours have been during the darkest days; the warmest thoughts have been during the coldest dreads. Praise, praise God Who has touched our sorrow with His blessed hope! May this hope continue to be yours as another anniversary of Drew's and Jeremiah's Homegoing approaches. I lost my youngest child, my son Mark to a auto accident. He died instantly pretty much, to a traumatic brain injury. His friend David died from that same accident, just two days later. Mark was 24 years old at the time. I have one other child my daughter Shar, who is living still. She suffers the loss of her only brother. MY husband and I suffer the loss of our only son. What was once our family of four is now three, and life will never be the same. Mark was born on 11-14-1978 he passed away on 4-3-2003, just 2 days after our 25th anniversary. What an awful silver anniversary gift. A time that should have marked a mill stone in our life together, but instead, Mark earned his siver wings. I know he is still with me. He has shown me the many ways that he can communicate that he, "still is", just different. I saw him a couple of days after his death, standing beside my bed. He wanted to tell me that he was so sorry, that this had happened. I understood his thoughts to me, that night. Months later, I heard him say (no mom! )which saved me from stepping into the road and getting hit by a truck. I've heard the sound of screaching tires in my home phone, ever since his car wreck. The phone never did this before his death. He comes to me in dreams, telling me of his new life, or that he is sorry, or to help me or others in some way. This is such a hard path to walk. At times it seems too difficult, but walk it we must. We have no choice. I've written a book too: "Choices The Ripple Effect". I'm currently looking for a publisher or an agent. I'm finding this to be very hard. But as with any worthwhile project, I won't give up. I have also set up a web site in memory of Mark. www.choices-therippleeffect.com Thank you for listening. I am so sorry for the loss that we all must face, as we travel this rocky road. Children should never go before their parents, it just isn't right. Rosemary, Thank you for the wonderful tribute to your sons and the work that you do. Your Angels in Heaven are looking down on you with pride. Hugs, Cheryl Widup Mom to Angel Son Adam Forever in my heart! This is truly Beautiful tribute to your precious Angels Jeremiah and Drew. Thank you for sharing them with me. I CAN'T EVEN IMAGINE WHAT IT WOULD BE LIKE TO LOSE ONE OF MY CHILDREN. I PRAY THAT GOD WILL ALWAYS BE WITH YOU AND COMFORT YOU THROUGH OUT THE REST OF YOUR LIFES. GOD BLESS YOU. Holding you close in prayer as Drew's birthday approaches. We know our pain never really goes away, and resurfaces with renewed strength tearing us apart with those same memories that hold us together. Receive warm, knowing hugs from one who knows you pain. I thank God everyday for my son and am so thankful that he is still here on earth. It is unimaginable what it would be like without him. Your parents are the strength and support for so many families that have lost their children at an early age. I know that if God should decide to take Josh, they would be there for me and it is a comfort that I am hugely aware of. Happy Birthday Drew! I can't believe it has been 14 years since you've been gone. I still talk to you all the time in my thoughts and heart. Your spirit was so strong it is hard to forget, even as time moves on. Rosemay, Luther, and Jordan - I hope you are doing well. We've been thinking of you a great deal here! As I sit here on this beautiful April morning in Kentucky, I vividly remember that April morning thirty-two years ago when your Dad and I headed to the hospital. To say we were excited would be an understatement. Your birth just before 6 PM that night in Louisville was a miracle beyond comprehension. The short eighteen years we were graced by your presence was not enough dear son. We miss your smile, your compassion, your fierce sense of right and wrong, your music, your voice, your relationship with your brother Jeremiah and of course Jordan who is left to live his life without either of you. Dad and I have tried to live our lives with the compassion for others that you had while you were here with us. We live it though with only a part of our hearts...the other part is with you and Jeremiah in heaven. Such a Beautiful Sight, for 2 very Handsome young men. Thank you for sharing Drew and Jeremiah. Your book is wonderful and fills my heart with hope. Thank you so much. I couldn't sleep tonight and i thougt of your web site it is a beautiful thing, I lost my sweet nephew September 19, 2005 in a go cart accident and my sister received your package in the mail it has really touched her and my family. Andrew was a sweetheart and we are having such a hard time dealing with this. You and your family are in my prayers and I beg for everyone's prayer for ours. I just wonder why these things happen. I do know Andrew is with God and we will see him again someday but it hurts so bad. God bless you and everyone else who has lost their children. Rosemary and Luther and Jordan, I just wanted to say I wish you all a very blessed CHRISTMAS and New Year. I just received the books and cards from Andrew's coach, it couldn't have came at a better time. Andrew will be gone 1 month tomorrow and I am just lost! I will write to you about Andrew and send a pic! Thank you so very much, it helps to read that I am not alone in my feelings! I am sorry for your loss. I to have lost a son. I know the pain is there but with gods help, we can get through this. May god bless you. You have truly been a life savior to so many families that have lost their young loved ones. I know all I have to do is send you an e-mail of some tragedy in the Houston area and you are so helpful to those families. Many thanks. Drew and Jeremiah I am sure are looking down on you, Luther and Jordan and saying "Job well done. We are so proud of you." Warren and I hope to visit Drew and Jeremiah again this year if we make it to Lexington. A lot depends on how Yvonne is doing. Our love to all. I was fortunate enough to spend a weekend at the Smiths home recently. Their son Jordan is one of my great friends. I became voracious for more information the more I got to know this family. They are one of the best families i have ever met and not one part broken. They share a love for one another and for others that many people will never see. Drew and Jeremiah were lucky in that they had such a solid rock as a family. Hello Rosemary My precious nephew Eric Horn(age 20) died just a few short weeks ago. My sister and my entire family is devasted. You sent Eric's mother (my sister Judy) a berevament package. Thank you so much for reaching out to Judy, Gary and their daughters, Sarah and Laura. Our family is very close and all the children in this family are the same as our very own. It is a kindness that was needed because in our own grief we have not been able to find resources for our sister. It will be a long long road for all of us but God is still good and it is comforting to know there are unselfish people, such as you, in a world that can normally be blind to the pain of strangers. God bless you and your family! I have lost 2 sons, 23 yrs apart. My son, Bradly Vance died when he was 4mos-29 days he was born on June 18, 1979, premature he died on Nov. 17, 1979. The Dr. who took care of my son gave him an overdose of medications and the Pharmacist filled them. My Son, Lance George was born on January 18, 1981, he was killed in an airplane accident, July 20,2002 coming back from the Bahamas with his friends. All 5 on board were killed in the Atlantic Ocean 2 miles from USA They had encountered hail the size of grapefruits and was entering storm clouds enroute to Palm Beach, Florida My son, Lance was my life he was 21 yrs. old. He went to college in Florida, worked at IBIS Golf & Country Club. He made me happy when I was sad. I lived in New Jersey I would see him every couple of months. Our last visit together was June 26, 2002, when his father and I were with him. When we were leaving to get our plane he started to cry. That was the last time I saw him alive. He called me up the day they! were leaving for the Bahamas. He told me, If I should die in a plane crash,just want to say, "I Love YOU, MOM. He died in a plane crash and I live and hear those words every day. I have 2 daughters 7 yrs. apart Nicole is a Criminal lawyer her brother wanted to be a tort lawyer and join a practice with her. Her sister, Danielle, is in college for Journalism and Communications. She wants to be an anchor woman. Danielle and Lance were like "two peas in a pod" when they were small. His death affected everyone who knew him. He cared for kids who were handicapped taught them to golf. He is deeply missed by family and friends and especially his girlfriend, Rachel. One day he was going to marry her. They had been together since the 8th grade. My youngest daught went to a psychic and she was told that her older brother Bradly was there before he fell into the water, Lance wanted to find the guy who saved him. He was told that it was Bradly! Lance began to cry, because he knew who Bradly was because we visited his grave often. And he was told that it was his brother that was there for him. Then he knew he died. Your site is a nice one and i sympathize with rveryone that has lost a relation i also lost an uncle sometime last year and it was very painful. My heart goes out to you and what yo had to go through. I have just lost my youngest son Nick on July 23, 2004 in a horrible car crash. He was 24. The pain never goes away. I want to thank you for sending me your book. It has helped me a lot. Rosemary, I recieved the grieving package today and I was so touched by what you has sent. It was so very thoughtful of you to do this for our family. I haven't got a chance to sit down and read it but looking through it I can see there is going to be a lot of resources that will help my husband and our children to cope with the loss of our little Ethan. It has been a very difficult time and it isn't something you can prepare yourself for. Not a day goes by that I don't ache in my heart to be a mother to Ethan. Thank you very much for coming into my life. Just wanted to add my condolences. I had a son that died when he was 17 months old. He would be 43 this coming January 6. But no matter how much time has passed, I can remember like it was yesterday. It is something you never get over. Dear Smith Family: I learned of your story in a good sort of way, my son began college at Cumberland this fall. I learned of the dome from a friend at work a two hundred miles from here though. Since I have two boys about the same age as your two, I could not wait to get back up to the campus to see "the dome". Although I have not been able to get a copy of your book yet, I do intend to read it. Just knowing what I know of your story touched me to the core. My two boys are still living but and I could think of no greater pain to befall me than to lose even one of them. One is eighteen and one is seventeen, have their own lives, making their own choices, and constantly on the go. I worry far too much and pray far too little. I will definitely read your book. Just wanted you to know how many lives you and your boys have touched from a distance. God Bless you all, again! Rosemary, thank you again for always reaching out to the other families and parents I email you about who have also lost a child. They always have nothing but good to say abotu you/the packets. Rosemary & Family, We are so sorry to hear about the loss of your two precious sons. My husband lost his only son (my step-son), Kevin at the age of 25 on February 29, 2004. It happened in our home, and we found him on the floor of our laundry room. It happened in the early morning , and we just can't get past the guilt we feel at not going to check on him. I am hoping that we can connect with other parents who have lost children, regardless of age. My husband suffers so much, and I feel guilty on a certain level because my children are still here. I would like to start a bereavement group or something for people who have lost children, but I am not sure how to get started. I believe if we can just talk and communicate with other grieving parents, it would help. My husband says nobody understands his pain. Well I think there are many people who do, but we just haven't connected with them. Anyways, thanks for the wonderful website. Your boys are beautiful! God Bless you and we will include you and your family in our prayers. I am so sorry for your loss of your two precious sons. My husband lost his son, my step-son on February 24, 2004. We are having a very hard time dealing with the loss and grief. I am glad I came across this web-site, maybe we can connect with other people who have experienced this pain. God Bless You and All. We can't thank you enough for all you do for parents who have lost children. You will have a special place in Heaven! GOOD DAY ROSEMARY AND FAMILY.HOW IS THINGS? I HOPE FINE. DO NOT BE ANGRY THAT I NEEDED SOMETHING FROM YOU ON MY FIRST DAY OF KNOWING YOU,IT IS JUST HOW CONDITIONS HAS MADE IT BUT PLEASE, I WILL LIKE YOU TO COME TO MY AID. I AM A STUDENT AND HAS LOST MY GUARDIAN, I DO NOT HAVE ANY OTHER PERSON TO ASSIST ME AND IF THIS CONTONUES,IT'S LIKELY THAT MY EDUCATINAL CARRIER WILL END. I THEREFORE ASK YOU TO PLEASE LISTEN TO ME AND HELP ME OUT AS YOU CAN.I SPENDS SEVEN HUNDRED AND EIGHTY DOLLARS EVERY SESSION, AND STILL HAVE ABOUT THREE SESSIONS TO SPEND IN SCHOOL BECAUSE I AM IN SECOND YEAR AND I AM DOING A FIVE-YEAR COURSE. I WILL PLEASE LIKE YOU TO HELP ME OUT. YOU CAN CONTACT ME THROUGH MY MAIL ADDRESSE OR CALL OUR NEIGBHOUR'S PHONE 234-42-454820 AND ASK OF ME ie UCHENNA. I WILL BE VERY HAPPY TO HEAR FROM YOU. Rosemary, I received your package yesterday. I tried e-mailing you at Childrenofdome@cs.com, and it was returned to me.? I wanted to send you my thanks. What is your correct e-mail address? THANKS FOR THE BOOKS. I READ THE BOOKS AND THEY WERE VERY SOOTHING TO ME. THANK YOU VERY MUCH. PLEASE E-MAIL ME ANY RECENT INFORMATION YOU HAVE. I WILL SEND YOU THE POETRY THAT ONE OF MY SON'S FRIENDS WROTE FOR HIM. AGAIN, THANK YOU VERY MUCH. My name is Patrick Casimir. My son Patrick was killed while riding his bike to school on February 4 2004. I received the package that you sent to my family and we were grateful that you contacted us. We read about the lives of Drew and Jeremiah. You lost two amazing boys. My family is sending our sympathy to yours. We sent you two pictures of our son Patrick and the web address of the site we created for him: www.patrickharmelcasimir.com. Thanks for the nice words, the card, the books, the CD, and the video tape. We truly enjoy them. Thanks for the support. Drew and Jeremiah will never die. They are living inside of you. Rosemary & Luther, Just wanted to drop a line to tell you what great job you did on the web site. It is hard to believe that Drew and Jeremiah are both gone. They were wonderful children. Makes me thank God everyday for my boys (Or young men) Losing Loved Ones is such a hard thing to do..... God Bless You. I am the mother of US Army SPC James R. Wolf, killed in action near Mosual, Iraq on Nov 6, 2003. My heart aches everyday for him. But your book has comforted me in knowing that others have gone through the same emotions that I have, and that I am not alone. Thank you for your wonderful words of wisdom, and for the stories that touch our hearts so dear. Your sons sound like wonderful young men,and that there is a special place in heaven for these young souls. GOd bless you and thank you. Rosemary and Luther, Hope you all are doing well! The site looks great and I am so proud of this incredible work that you all do. You both are angels here on earth! Growing up, I always felt like I had three brothers - my biological brother, Charlie, and Jeremiah and Drew. Today, I still feel that way. Whether it be a butterfly flying around me or a sudden gust of wind when I am thinking about them or sometimes even that little voice in my head, I just know that they are here with me. Never will I have a bond so strong with two boys again. I treasure the time that I was fortunate enough to have with them here on earth. ROSEMARY,MY NAME IS LINDA FOLEY, MY SON AARON PASTED AWAY JULY 23, 2000. 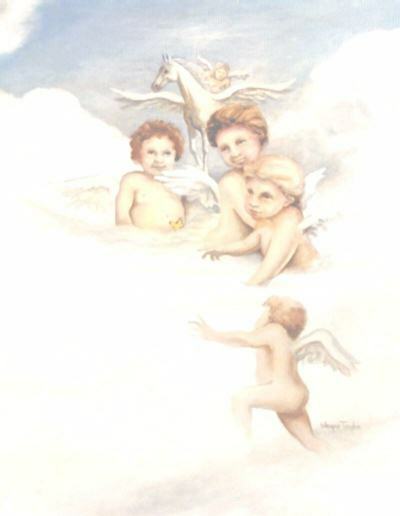 AARON PASTED AWAY AT HOME, HE DIED OF RESPITORY FAILURE, AARON WAS 19 MONTHS OLD.DINAH TAYLOR GAVE YOU MY NAME AND YOU SENT ME A CHILDREN OF THE DOME BOOKLET, THANK YOU SO MUCH FOR ALL THE LETTERS AND CARDS YOU SENT ME. AT THE TIME I DIDN'T THINK NOBODY COULD HURT AS MUCH AS I WAS, BUT AS TIME WENT ON I REALIZED OTHER PARENTS WHO HAD LOST THERE CHILDREN AS WELL KNEW MY PAIN AND UNDERSTOOD EVERY TEAR I SHED, EVERY NIGHT I LAID AWAKE WONDERING WHY. DREW AND JEREMIAH ARE IN HEAVEN WITH MY SON AARON AND I KNOW THERE KEEPING EACH OTHER COMPANY. MY SON'S SYMBOL IS ELMO.GOD BLESS YOU AND EVERY PARENT ACROSS THE WORLD WHO SUFFERS THE HORRIBLE AND PAINFUL LOSS OF THERE CHILD. You have my sincere sympathy for your loss of two wonderful sons. I too have lost a child. Her name is Chelsey Renee and she died from interstitial pneumonia and a brain hemmorage which was caused by an undiagnosed virus. She was 14 years old when she died on December 2, 2000. I received so many cards and books. I also received your packet. At the time I was so overwhelmed with reading material, but I certainly remember yours. Thank you. I'm so sorry it has taken me this long to contact you. I certainly admire your tribute to your sons. Thanks for sharing your story and I am so sorry for such a great loss to you and your family.We found out about you through a Cindy Bullens concert. My wife and I had lost our 20 year old son on Dec.24 2002 little Darryl was a bright loving son who never had a bad word to say about anybody. He was loved by his youth church group as he always made them laugh as he always made me laugh. It seems now thay I will always be sadden by the memories of teaching him how to hit a baseball, ride a bike,pray,drive a car and shoot a basketball. Darryl knew the lord and had a personnell relation with him so I know I will see him again in heaven but for now that brings little comfort.He was never uneasy to tell his mom or I he loved us even around his friends I would say love ya son and would say I love you dad.Darryl will always be in our hearts Iam not sure if that will always bring the sadness it does today or if one day I will be able to look at his picture or trophys with a happy/grateful heart? I just know for now I miss him so much. i, just looked at all the pictures of all your boys they are so handsome. God bless you and your family. see you at williamsburg.love vada. Dear Rosemary, YOR BOYS LIVE!!! In your heart and in our soul. Thankyou for your inspiration! Our beautiful daughter, Chloe, the sixth of our seven children, who was born on 22/03/95 and died on 16/11/96 had MMIHS. Her first ten months were spent in intensive care, undergoing 14 operations to 'correct' her condition. We were told that children were her condition did not go home. We learnt to catheterise, aspirate, change central lines, and enabled Chloe to come home to her family. She learnt to come off her'lines', trampoline, scoot around in her baby walker and talk. We all took part in her final death at home, even the little ones, surrounded by friends and family, and I wouldn't have changed a thing... Chloe was the brave one! I'm happy to sign your guestbook. My little boy came home yesterday and asked why people go to war. It was hard for me to explain except to say that some people have forgotten how important love is. Let this serve as a reminder to everyone. Love and Peace. I just wanted you to know how comforting your words were at the Compassionate Friends of RVC meeting 3/14/03. The loss of my Little Girl, Lauren (3 Yrs 9 Months), on 5/5/02 has been so devastating and listening to you has given me some hope where I thought there was none. You are one Special Lady. Thank You!! Its bad enough that I keep getting spammed to death by these credit card debt offers. It seems like everywhere I turn I see ads for repair credit this and that. Now these companies are posting messages on your guest book to advertise their credit counseling services? Give me a break! Maybe some of us don’t mind having bad credit and just want to use the Internet in peace. Post your junk elsewhere. none. i just wanted to thank you for the words of comfort that you give all of the grieving families that have lost loved ones. I lost my cousin Jerica Hammer and a young friend Skylar Geralds in a terrible ATV accident on August 25, 2002. At first I was so mad at God for taking these two precious girls at such young ages (Jerica was 15 and Skylar was 8), but know I realize that they were really only Angels who God let us have for a little while until he missed them as much as we do now! If I could have only one wish granted it would be to let the world see the light that burned so brightly within these two girls. I hope they know how loved they are and how much they are missed. Jalyn Hammer, who survived the accident, is the angel God left here with us. She reminds us everyday how thankful were are for God's love, and Jerica and Skylar's memories live through her. Although our hearts are filled with the pain of this loss, we find comfort in your words and in knowing they are in a place full of happiness and love, Thank You for you words of kindness and comfort, Keep Jerry, Brenda,and Jalyn Hammer & Donald, Jill, and Elijah Geralds in your prayers. I am so sorry for the loss of your 2 sons. I admire all you do for grieving parents! Your memorial to your beautiful sons shows the love you had for them. I am so very soory for your loss. I lost my son, Kenneth on December 10,2001....311 days before I lost his Father to Cancer. Sometimes the grief is unbearbale, isn't it? I lost my daughter to suicide at 15 years 22 days. I am having a hard time dealing with one loss and you have lost two beautiful angels. Your memorial page to them is full of love and warmth for them. I want to tell you God Bless on your strength and what a beautiful site you have for your Angels. what a beautiful site to remember your sons. they were very handsome young men. i lost my beautiful 19 yr old son to suicide on nov.6,2000. it has been over 2 yrs and everyday is a constant struggle to stay here without him in this life. thank you for sharing this web site. I LOST MY 23YR. OLD SON IN A AUTO ACCIDENT ON 2/27/98. IT STILL SEEMS LIKE YESTERDAY. HIS BROTHER WHO IS 4YRS YOUNGER IS NOW A ONLY CHILD. HE ALSO HAS A DAUGHTER WHO IS NOW 6YRS. OLD. MY PRAYERS ARE WITH YOU GOD BLESS. Rosemary what a wonderful site for your Angels. I lost my Angel Everett on October 19 2002 to a auto accident. I am so lost. Everett was the youngest of 3 children, I want to thank you for all the wonderful things you do. Hey I really like your site. I have found some of the information here helpfull. Thanks :) Joe D. . I JUST WANTED TO SAY THANK YOU FOR GIVING PEOPLE THAT ARE GRIEVING HELP BECAUSE MOSTLY YOU FEEL LOST AND HAVE NOTHING TO LOOK FORWARD TO AND YOU UNDERSTAND.MY AUNT & UNCLE JUNE AND GREG WITTY LOST THERE ONLY CHILD AND THINGS ARE NOT GETTING EASIER LIKE EVERYONE SAYS BUT IT HAS ONLY BEEN 7 MONTHS AND 2 WEEKS.JONATHAN IS LIKE A LITTLE BROTHER TO ME AND I AM HAVING A HARD TIME BUT I AM SO GRATEFUL JUNE GAVE ME THIS WEB SITE.PLEASE PRAY FOR JONATHAN'S PARENTS BECAUSE WITH PRAYER AND UNDERSTANDING FRIENDS WE HAVE A BETTER CHANCE GETTING THROUGH ANOTHER DAY!!!! Thank you for sharing your sons with us. I am so sorry for the loss of your children. I lost my second baby at 19 weeks gestation to Triploidy Syndrome on Oct 26/02. Thank you again for your story. God Bless. Hi Rosemary. I want to first of all tell you how sorry i am for your sons. I know that had to be devistating to lose both at the same time. :( Second I think this is a wonderful thing you are doing for the bereaved parents. I lost my twin son Aaron Micheal to a congential Heart defect called Hypoplastic Left heart syndrome at 17 days old. He had the first surgery to reconstruct his heart and we lost him due to complications later on after the surgery. We love and miss him so very much every single day. I can see him in his twin sister Ashley every single day. She is so much a little tom boy!! Thanks again for your wonderful website it is truly a blessing. God Bless you and your family. Rosemary and Luther: I have visited you web-site many times, but I have not signed in. I think of you often, you are doing a wonderful, and much needed, service. Take Care. Rosie, It has been a long time since I visited the site. But today is the 10th anniversary of Shelby's death and for some reason I found myself here. I guess because I know that you understand what pain the yearly anniversary brings. I know how hard it is for me, because he was my brother, but I can only imagine my mother's pain and grief. Just like you and Luther. My prayers and love are with you all. Take Care. I am so sorry for the loss of two of your precious sons. My heart is also that of a grieving Mother. My second son, Dylan was Born Sleeping 3 days before he was due. My heart goes out to you and your family. It has been 15 months and it feels like yesterday. The future is SO differet now. I have a 4 year old boy who has literally kept me living on this earth. Rosemary, I was fortunate to hear you speak last year (2001) at a Compassionate Friends conference in Dayton, Oh. Your words were such a blessing to me. Our son, James Michael Alexander - age 22, died October 4, 1999 from a undiagnosed degenerative mitral valve. Michael was 6'1" and weighed about 160lbs. He went hunting after work (opening day of bow season) and did not come home. After several hours of looking, my husband found him in his deer stand where he had died several hours earlier. The pain and devastation that we felt continues to be a part of every day. I know you understand that very well. Michael was our baby who still lived at home. Our relationship was very close and he was such a pleasure to be around. He was a compassionate, kind-hearted young man. We have been very blessed to have a loving Minister and wife that surrounded us with their prayers and love. Even though they have been transferred a couple of hours away, they continue to support us. Our daughter, who is almost six years older, misses her brother very much. God blessed our lives with a grandaughter, Lexie, on Feb. 22, 2002. Michael loved children and I often wonder what he would have thought of her. We continue to struggle with the "why" and how to continue on without Michael, but we know that he is with our Lord and Savior. Some sweet day we will be reunited with him and that is the only way to "survive". Your web site is awesome and a wonderful tribute to your beautiful boys. They must be so proud of your desire to help others. Thank you so much for you willingness to share your pain with others. This site has stole my heart tonight. I love the photos of all three of your boys together. I am also the proud mother of 3 sons. 19, 17, and 15. My (would have been) 17 yr old, Nathan, died at age 14 from brain cancer. It is so very heartbreaking for brothers. I saw your message in this guestbook, from Jordan, and it touched my heart. His brothers must be very proud of him. And I know you are! Everyday is still a struggle for me, anyways, just want you to know I appreciate your site. Greetings to you and your guests. Love what you’ve done with your site. As an educator I can say you have great communication skills. My heart is with you. What a beautiful site TO HONOR your kids.Take good are! STRENGTH AND courage!!!! I lost my 25 year old son, Jason, three years ago.Peace be with you.Thanking you so much for sharing. Love, Lynn . Hello Rosemary and Family, Our Pray's are with all of you. We share your pain in losing a child. Keep on making your boy's proud by helping others who might not have the strength and do not know where to turn for help. My daughter Anelise was such a source of energy for our family. I will always try to make her proud and I look so forward to the day we will see each other and get that hug I so miss. Have faith and God Bless, Anelise's Dad. Dear Rosemary, I am so sorry for your loss. I thought that I would tell you a little about my daughter Candace. She was 17 years old and she died in a fatal car accident on February 1, 1998. As you know she was my only child. Candace was going to borrow a friend of mines car to take herself and her friends shopping. She didn't make it back home. I called her on the phone and we talked she told me that she would be home in a few minutes and then she said I love you mom. I told Candace that I loved her also and for her to be careful. She told me that she would. The accident happened and she didn't make it home. This is the hardest thing a parent can do. We should never have to. Candace was a beautiful and loving child. She was my best friend and she always will be. I miss her so much. This has been the hardest thing I ever had to do. Your site is wonderful. That is something that I would like to do for Candace if I knew how. You paid a beautiful tribute to both your boys. May God Bless you. I am sad to hear that you lost your two sons at such an early age. But I am a firm believer that our kids do continue to live on at a higher level. I too lost my son Jasper at the age of 15. His website www.jasperliveson.homestead.com is proof that I will continue to think of him as leading a full life, just not here. Thank you for sharing with us grieving parents and know that you made a difference in my life. Sorry for taking up space. You do offer a guestbook. Thought I'd sign it. http://www.where-i-find.com. Rosemary and Luther - the bust of Drew and Jeremiah is wonderful. Mary really saw the life in the both of them. She even captured Drew's great hair! I miss him still. Days in life are easier, though, with him still a part of me and cherring me on, as I know that they both do for you! Love you both and hope to see you soon. I just heard about your book from Carol. Look forwarding to reading it. I miss my annual trip to Beattyville. God bless and good luck. Greg, Amy, Grant(7) and Rachel(4). P.S. we are saving Grant's sweater you gave to him. Please click on the link named "Guest Book Page 1" at the top of this page to view previous guestbook entries. I want to thank you for allowing my dear friend Ella Prater to share the story of the life and passing of our beautiful Merri Kathryn. She was a true angel to all of us who knew her and loved her. The idea of this book is the most heart warming of any...to read the stories of love and devotion from these families shows us all that when you hold someone in your heart...you will never have to let them go. WE LOVE YOU MERRI KATHRYN...YOU DEEPLY MISSED!!! DEAR ROSEMARY MY SON BRYCE SCHULTHEIS AGE 6 MONTHS PASSED AWAY A FEW WEEKS AGO ANDIT HELPS TO NO HE IS IN HEAVEN WITH YOUR SONS. The web-site for your two sons is a beautiful tribute to them.Thank you for sharing them.We lost our 20 year old son on April 8,2001.I hope sometime soon to be able to have a web-site in his memory. Rosemary: What a beautiful web site for your sons. I came across your page looking for answers. We lost our 2 year old in May of 2001 to Severe Combined Immunodeficiency *A.k.a: The Bubble Boy Disease*. My heart aches more and more every day. How does it stop, or get easier? Rosemary, you have a special place in our hearts! What a privilege to know you and your family. 2 Corinthians 1:3-5........"GOD IS THE FATHER WHO IS FULL OF MERCY AND ALL COMFORT. HE COMFORTS US EVERY TIME WE HAVE TROUBLE, SO WHEN OTHERS HAVE TROUBLE, WE CAN COMFORT THEM WITH THE SAME COMFORT GOD GIVES US. WE SHARE IN THE MANY SUFFERINGS OF CHRIST. IN THE SAME WAY, MUCH COMFORT COMES TO US THROUGH CHRIST." Hello, Yes I to have a daughter that is on the other side,passed suddenly of a heart attack,The one thing for sure I know about all of this that the pain has never left.I also find no one wants to hear about your pain either.I think no one will know what you go thru until it happens to them.Its made me feel more vulnerable to my own passing, I know I will see her again but the pain before I get their is almosst unbearable, I only think of her for just a few mintues a day or else I would lose it.I have no big message to get people thru this.God will listen and the Mother Goddess ,and the angels .thanks for listening if only for a moment.